Lots of fringe belts, tassel belts and hip wraps tie in front- nice- but all the fancy design elements are relegated to the back. 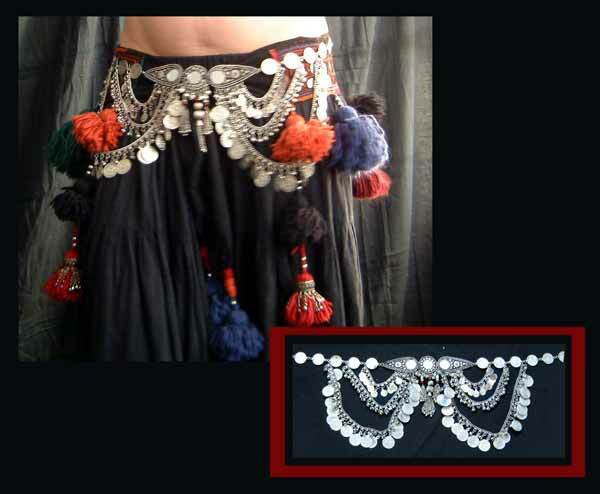 If you want something to complete the lush Tribal look, especially if that gorgeous mirrored tassel belt barely makes it around the hips- This front focused coin belt is guaranteed to do the job! 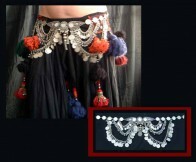 It also makes the most spectacular belly drape know to woman! A beautiful blending of mirrors, metal work and antique Raj era coins. Imported from India. Lush draping in front, plain single coins and chain in back, with adjustable hook closure. Color Color: silver/ pewter. Sizes, S/M fits hips up to 40 inches, L/XL fits hips up to 55 inches. (and of course adding safety pins will take it to any length you want). Typical Indian construction- needle nose pliers will come in handy for the occasional loose coin. Generally in stock and ready to ship! Part of the Mirror and Metal Collection: Headpiece, Necklace, Coin Bra and Earrings! -- Choose a Size -- SOLD OUT -- Choose a Color -- mirror/ pewter/ SOLD OUT!